tl,dr: WF Conventional, Batesville Grown; Juicyness = 3, Sweetness = 3; Price = $2.49 / lb; Recommend: without reservation! Hands down, the best nectarine of the summer. When Plato imagined his forms, he was thinking of the Batesville grown, Crown Orchard’s nectarine. Honestly, the only reason you wouldn’t eat this nectarine is if you didn’t like your fruit that sweet. And at $2.49 / lb, it beats out a lot of the competition at the same price point. Caveat emptor: Hopefully they are still in stock! This blog hadn’t been created when I ate it on July 4th. 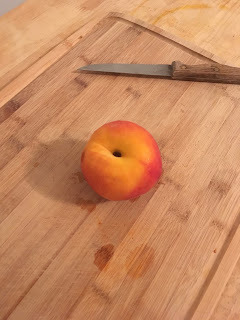 This nectarine was fairly sweet and juicy. The skin was a little tough, but I enjoyed eating it. If you don’t mind the price, it’s a good option. Admittedly, I was not expecting to like this nectarine. You see, I began this experiment as a snob, and this was a conventional nectarine from Kroger. But this was good, and it ripened overnight. It was decently sweet, and conservatively juicy. I’m starting to get a thing for white nectarines. They’re sweet in a different sort of way than the yellow ones. For $2.19 / lb, this is a good option. My first bad review. This nectarine is terrible. And not terrible in a good way. Terrible in a disappointing way. You see, this nectarine smelled great. But was it juicy? No. Was it sweet? No way. You can do better, Kroger. You can wait days and the skin on this puppy will never get soft – just weird and taught like a bad face-lift. Stay away from this nectarine. Even if you are very price conscious (and this is a cheap nectarine), it’s not worth it. Here at chirbah, we don’t aim to be scientific, but we at least aim to be principled. This will likely be an evolving metric – after all juicyness doesn’t quite seem like the right criteria by which to evaluate an avocado – so when we get there we will revise. Admittedly, the system permits the user to use floating point values (i.e. 3.5s and 1.5s) when they are feeling squishy, but generally speaking the reviews should adhere to the above notions of juicyness and sweetness. 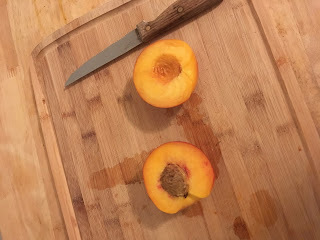 Tonight I ate a peach. I washed it, and then I laid it on my landlord's stained wooden cutting board and photographed it. For you dear readers, I took its pictures. Some people's religions forbid that kind of thing -- but I am the devoted type. Anyway, I took its photo, as you see here. This was a good peach. A peach we can appreciate. Not a peach you write your momma about. Not a peach you dream about. But a good peach nonetheless. It was sweet, but not terribly so. It had juice, but I wouldn't call it juicy. Still, if someone came up to me and asked me, "Josh, is that a good peach? ", I would have no choice but to say yes. So, you can buy this peach. But at $2.49 / lb, you're better off going to Whole Foods and buying a local nectarine (same price). A few weeks ago, I had a bad nectarine. The problem was, I expected it to be good. It smelled good, and it was ripe to the touch. But when I bit into it ... disappointment. So I started to think, "Can technology solve this problem?" My first instinct, as a follower of the cult of data scientism, was to train an image classifier. Surely there is some signal in the fruit's appearance that would betray its inner qualities. My estimable colleagues quickly dismissed the idea. If a human can't tell by looking, touching and smelling, how could a naive machine learn anything by appearances alone? No, this was a problem for mankind. For the crowd. For the hive mind. Solving this problem is the long term goal. Imagine a mobile app full of user reviews of your local grocery store's produce. They would be timely (reviews of this week's delivery of Granny Smith apples are not valid next week), and hopefully there would be a lot of them. Anyway, that is the long term goal. The short term goal is to start eating fruit, writing about it, and seeing if such information solves anybody's fruit problem. So, chirbah -- the blog. The name, if you're wondering, is a phonetic spelling of 吃吧 which is what Chinese people say when they want you to eat something. I like the way it sounds. That's it for now, dear reader. I hope I can help you with your fruit.